The Sweet Briar Slave Cabin has a fascinating and unusual backstory. It has been in continuous use for about 170 years. It was built around the 1840s and lived in by enslaved laborers on the Sweet Briar Plantation. After emancipation the cabin was the home of postbellum servants. After Sweet Briar College was founded in the early 1900s, the cabin was used for a variety of uses, including the Alumnae Office, a theater classroom, a coffee shop, and a farm tool equipment museum. This Fall the cabin will be open for self-guided tours on a variety of days (see below). If you have questions or any additional information about the history of the cabin, please email Dr. Lynn Rainville. Wednesday, 1-3, Thursday, 10-12, Friday, 2-3:30. 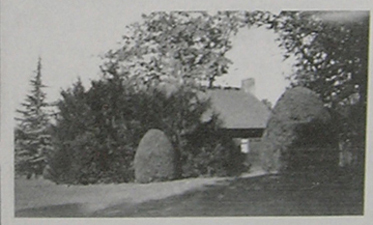 An early photograph of the cabin, c. 1911. Directions to the Cabin. Parking is available ("P's" indicated limited parking, the large lot has plenty of spaces. 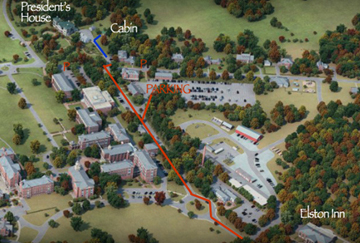 You can drive as far as the orange line, the blue line indicates the short walk to the cabin from the road. Click here for a map of campus.